Shopping for DC Comics Action Figures? Send the DC Super Hero Girls into action with these Super Hero vehicles with wheels that roll. Young superheroes can drive into all kinds of adventurous tales! Each 6-inch action figure is ready to ride in a riding outfit with signature colors, iconic elements, and removable helmet. With matching colors and symbols, the vehicles make perfect Super Hero complements. Ride into imagination and discover your inner hero. From a routine school day to a Super Hero adventure, the DC Super Hero Girls are ready for any challenge! Colors and decorations may vary. Ages 6 and up. 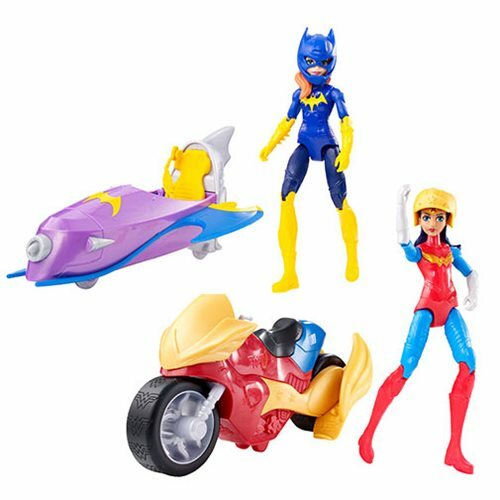 Wonder Woman's motorcycle sports golden wing details, and Batgirl's Batjet is adorned with a golden bat-shaped symbol on the hood.